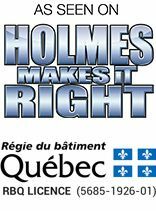 Water Damage Montreal focuses on providing quick and reliable services to all of our customers. A water damage is an unfortunate event that can cause plenty of stress and worry. A water damage is a huge threat to your home. That is why our water damage restoration Montreal services are provided with one key objective in mind - to provide full reconstruction services to homes affected by water damage within the shortest time possible and to make sure that the problem is dealt with conclusively, once and for all.